Confocal immunofluorescent analysis of mouse Tg2576 brain which overexpresses mutant human APP695. Sections were labeled with ASC/TMS1 (D2W8U) Rabbit mAb (Mouse Specific) (Alexa Fluor® 488 conjugate) #17507 (green), β-Amyloid (D54D2) XP® Rabbit mAb (Alexa Fluor® 594 Conjugate) (yellow), and GFAP (GA5) Mouse mAb (Alexa Fluor® 647 Conjugate) #3657 (red). Samples were mounted in ProLong® Gold Antifade Reagent with DAPI #8961 (blue). 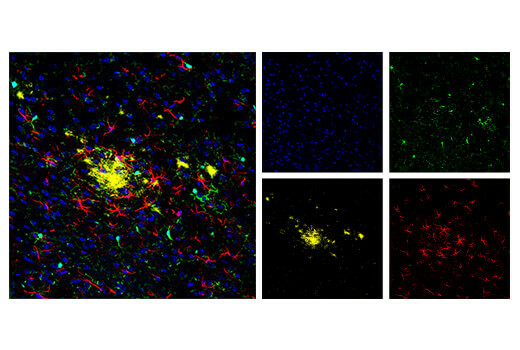 β-Amyloid (D54D2) XP® Rabbit mAb (Alexa Fluor® 594 Conjugate) recognizes endogenous levels of total β-amyloid peptide (Aβ). The antibody detects several isoforms of Aβ, such as Aβ-37, Aβ-38, Aβ-39, Aβ-40, and Aβ-42. This product detects transgenically expressed human APP in mouse models. This Cell Signaling Technology antibody is conjugated to Alexa Fluor® 594 fluorescent dye and tested in-house for direct immunofluorescent analysis. The antibody is expected to exhibit the same species cross-reactivity as the unconjugated β-Amyloid (D54D2) XP® Rabbit mAb #8243.